Would you like to join the FlaminGO! family? Signing up to be represented with your business can be done in just a few steps. In fact, you’ll have different possibilities, depending on your unique needs and depth of your business. Once you’re registered, we’ll make sure that your business is represented online i a matter of minutes. – You can include a main header, add a short description about your business, add pictures, social links, contact information and a map location in our Basic package. – If you’re in need of more pictures and direct contact to millions of potential customers, then the Professional package is the perfect opportunity for you. – If that’s not enough and you’ll be in need of more pictures of your location, and even like to add a booking form to the profile, then the Premium package is your choice to aim for! 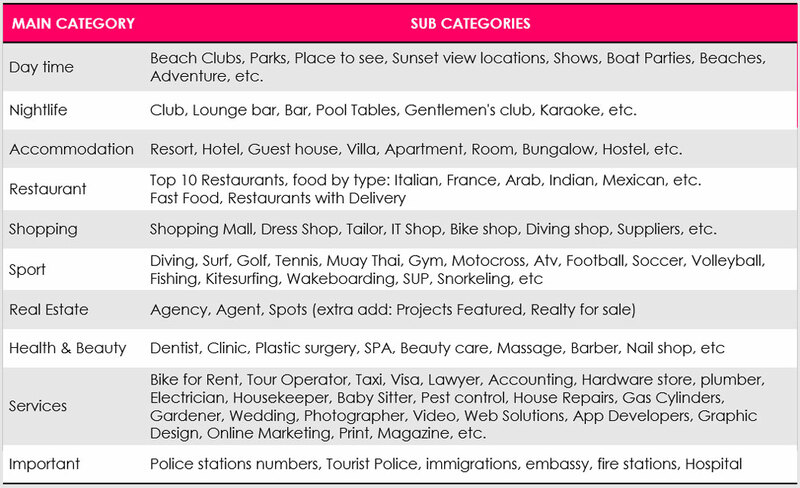 By registering your business to this App you’ll be represented 24/7, in multiple languages and be enjoying an array of advertising we’ll carry out in order to get our App seen by relevant target audiences coming to, or living in Phuket and its surrounding. Don’t keep wasting your advertising budget on old-fashioned marketing measures – come join the future with us. 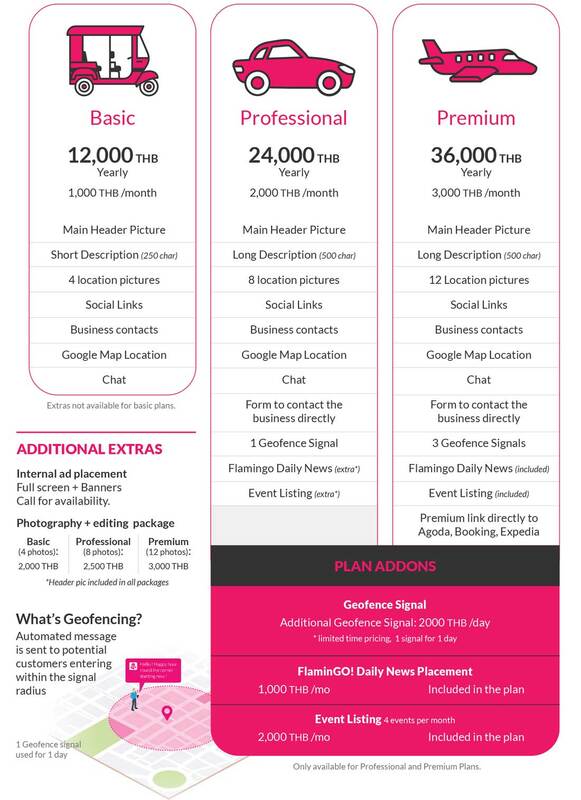 What is even better – with these low package prices you almost can’t afford NOT to be represented with your business in this App! Reach out to millions of potential customers by signing up today and reap the benefits from the App starting from tomorrow. We welcome you in the FlaminGO! family to make the user-experience sublime, allowing the users to find their desired services and products at ease – with just a few touches of their hand. Our Packages ready for you! Will be provided to you in: English, Chinese, Russian and Thai language. And you will be met with easy navigation, so you’ll be spending less time in a guide book, brochure or flyer, and can direct the focus on experiencing and enjoying every minute of the special feeling of Phuket, in all its beauty and diversity! 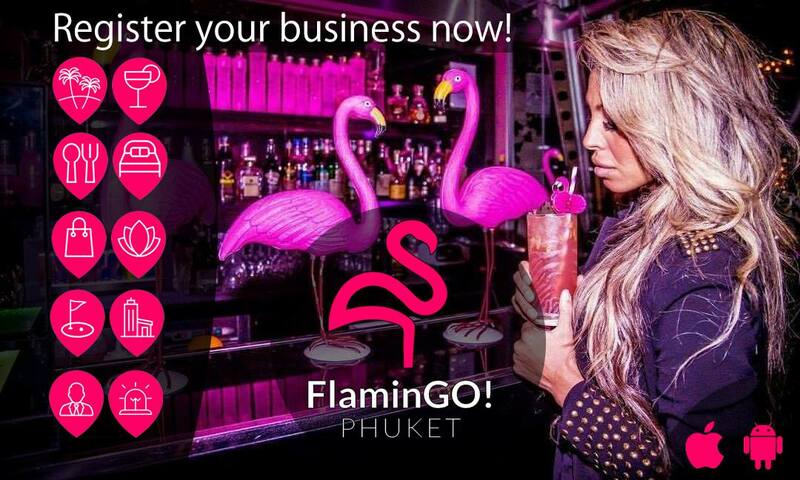 Your business ranking inside FlaminGO! is very important! For this reason we categorize all the business properly in different sections, and for this we divided also in packages in base how you much you want to be present in the application. No more ranking reviews that in many Portals are with fake registrations. – Priority to the PREMIUM package then to the PROFESSIONAL and then BASIC. – Is important how much you care to your presence online, so we give priority to the business that has a website, and more important a website mobile friendly. Mandatory in 2017 from Google ranking. – The social networks also is an important feature to integrate in your Business page, so we care also how much the social side is followed by your social page administrator. Which is your Business? Which Category represents you more? Subscribe your Company now! – The App is made with the knowledge about the Phuket island, so it is build in base of the know interest of the Tourist and the Local people. – The app is made by my company Crazy Web Studio Co.,Ltd, as you know now a warranty in the island with many customers. And all of the satisfied. The app is build 100% by my team with an experience in the branch of minimum 10 years. So no external companies in the project. – The app is made in 4 different languages, the most required in the island: English, Chinese, Russian, Thai. Yes also Thai language to make the local people more connected with their business also around areas where the business is mostly Thai speaking. – The app is made with a fresh design and innovative features, and also will be available for IOS and ANDROID on 15 November 2017. – Every location independently than the package they will apply, will have the possibility to show for their business: Pictures, Description, Social Icons, Contacts, Map Location, Drive me to the location, by google Map. A common problem in Thailand due to the address not recognized, we will use directly GPS information. – To sponsor the application will be in the future a continue update by events with flamingo around the island, and also all the location will apply in the application will have flyers, merchandising and stickers to download immediately the application, All the hotels, Tour Operators, Bars, Restaurants etc etc. A collaboration with the shopping Malls is starting, next week we finalize how to show FlaminGO! brand inside their locations, also after this step a direct proposal with the airport will be applied, and maybe FlaminGO! will integrate also all the departure and arrival flights by a simple click in a dedication section in the APP. – Maps is based on one location only, or can include an unlimited number of points (if you have a more directory-like project, locations, bars, shops, restaurants etc). With each one providing information, photos, links,and contact information. Best of all, step by step directions from wherever your user is are available for each point—providing this logistical information is the basis of getting them to you. – Forms are a multi-purpose tool. They can be used for conducting surveys, gathering contact information for mailing lists, receiving customer support requests, or even as an ordering platform. Form results can then be exported for further use and evaluation. Having a quick and easy channel of communication from user to owner is a crucial element of every successful business operation. – The main feature of this app, to take the application not only as a database of information, but a real new chat concept to make the clients immediately connected to a business, and also the most important thing to make the users connected to each other with a new simple chat with visible locations on the map! A chat feature allows your users to get to know each other-whether it’s for social purposes or for the purpose of exchanging opinions about your establishment, it’s a great way to get people engaged. Users can view each other based on a list template or a map template which displays who is closest to them. For security reasons, a blocking feature is also provided. The chat function can also serve as a customer service tool in which users can chat with the app owner to get answers, place orders, and more. – Geofence Signal, Being able to deliver a message or offer to users at the right place and right time is crucial for increasing conversion rates. Geo alerts allow for contact to be made at the very moment customers enter a designated zone, through geofencing, while trigger alerts as the user approaches a specified object. – Display and even notify your users of events, sales, and new releases. Either pull content from a source you already have set up (i.e. Google Calendar, Facebook Calendar, etc. ), or manually input events. With several templates created specifically for event display to choose from, you have a lot of great options to provide users with, such as a link for directions, a button to buy tickets, sharing possibilities, and your contact info. Want to be a part of FlaminGO! family in Phuket?